Earlier this year, I noted that The Office largely shied away from doing outright Halloween episodes, but the precise opposite could be said for Christmas. Other than the strike-shortened fourth season (when it didn't air over Christmas) and the non-season first season, the show has always had everyone gather together for this particular holiday. Holly Flax, meanwhile, is to the point of mythology. Part of it is Amy Ryan’s general awesomeness, and part of it is that Holly is legitimately perfect for Michael. She’s just crazy enough to play along with Michael’s antics and just sane enough to know when he’s crossed a line (or when anyone has crossed the line). It seems like an odd thing to say, but she’s really what would result were Michael and Toby to have a baby: She has Michael’s sense of play with Toby’s sense of reason, a combination which makes her the perfect woman to control Michael’s impulses without shutting them down (as we saw with Jan). “Classy Christmas” is an incredibly sad episode of television for the majority of its running time. Yes, it has your usual comic elements (Dwight and Jim snowball fight, what a hoot! Oscar hits on men, that cad! Pam’s crippling need for the approval of others, a laugh riot!—yes, at least two of these are sarcastic), but it becomes about the ways in which we idealize things from our past. Michael, because he refuses to possibly believe otherwise, presumes that Holly is single and ready to start their lives together. His view of Holly is so idealistic that pure, simple Erin develops an expectation that Holly will be the most beautiful person alive, an expectation which fuels a running joke (Erin can't believe Holly is such a big deal since she isn't pretty enough) that I never bought since Amy Ryan is radiant and wonderful and rainbows. Of course, the idealism falls away when Michael learns that A.J. is still in the picture, which he reacts to as one would expect Michael to react. At first, this seemed to be falling into typical patterns: Michael gets jealous, Michael ruins something that belongs to Holly, and then they get into a fight about it. And yet while I cringed at Michael’s attempts to turn it into some sort of bizarre setup joke for the party, the show got real. Michael wasn’t just blindly jealous of Holly being with another man: Michael was jealous because Holly had done for A.J. what she hadn’t done for him, entering into a long distance relationship following a work transfer. Michael wasn’t just feeling jealous, he was feeling betrayed, and there was a depth to his emotional response that we’re simply not used to seeing from the character. That moment when the entire office turns on Holly just rang so true for me (and in case you didn’t figure it out by now, my inner truth bell is one of the primary factors in my critical analysis). Michael’s behavior is not, necessarily, mature, but that it has reasons beyond “I want to be with Holly instead” is a really welcome bit of depth. Suddenly, Michael becomes a legitimately sympathetic figure, someone who went from having the woman of his dreams back in his life to having the woman of his dreams come back into his life and metaphorically stab him in the back by suggesting a hierarchy between the love she felt for him and the love she feels for A.J. Regardless of whether Michael desecrating Woody was right or wrong and whether Michael overreacts in general, this is pretty remarkable in that I sort of turned on Holly a bit. It didn’t last: Amy Ryan is still wonderful, and that little look as Michael becomes “real” Santa again is quiet and charming. And yet I do wonder how long the show can toy with our emotions—we like Holly, Michael likes Holly, and to some degree Holly likes Michael. Talk of ultimatums and the like seems to be building towards some sort of reunion, but how far is the show willing to go with sadness? Could it actually send Michael away without having achieved something approaching true love? Is love where this character needs to end? Or is a bittersweet ending part of the character’s journey? I don’t have answers to these questions, but Holly’s return (and the decision to have Pam give Michael some semblance of hope) certainly represents one of many red herrings being thrown around. I know that some of you don't want to be focused on Michael's exit as some sort of endgame, based on the comments, but this episode very explicitly raises these questions as Michael ponders his future (which we know will be splitting from the show's narrative in due time). The sort of emotional turn in Michael’s story tied in nicely with Darryl’s story with his daughter: How often has Craig Robinson been given anything even close to dramatic on the show that hasn’t been connected to some sort of disciplinarian role in the warehouse? Like Michael, he idealizes the past by remembering a joyous Christmas of iCarly and shopping sprees, whereas his daughter remembers sitting around watching TV and having to buy her own presents. There was nothing laugh-out-loud funny about Darryl’s story, but it was refreshing from a character perspective to have Darryl do something other than sarcastic distance. Some great work from Robinson early on, and a sort of sweetness that I quite like from the show. However, since I know some of you don’t think I talk about comedy enough, this wasn’t exactly what I’d consider a “funny” episode. Yes, Dwight and Jim’s snowball fight had its funny moments, but even there we saw a certain “reality” in the blood on Jim’s shirt and in his growing annoyance. I appreciate seeing Jim as victim, his hair mussed and his demeanor broken, but the story lacked any sort of humility, and the spitefulness of it all was pretty uniformly unfunny after the initial Snowman gag. I thought the payoff in the coda was quite fantastic, as Jim’s sense of fear takes over, but until that point, it was more a distraction than anything approaching entertainment. In the end, the episode went more for the cheerful moments of gift-giving and pleasantries than any sort of broad comic conclusion. I totally expected Jim’s phoned-in, unemotional gift of jewelry to be seen as some sort of failure, but instead, Pam is so wowed by the shiny object that she loves it all the same. While Angela’s Senator boyfriend does appear to be using her as some sort of beard, it’s a brief observation rather than any sort of broad discovery. Even Toby reveling in people’s sudden desire to talk with him is a brief talking head and then just Paul Lieberstein smiling more than he usually does (which is nice, but not exactly substantial). And so I presume “Classy Christmas” struggles greatly if you have no emotional connection to Holly and Michael. It isn’t funny, by any real stretch of the term, nor is it really intended to be funny. It’s a little sad, and a little sweet, and a lot more contemplative than explosive (beyond Dwight's snowball attacks, which are really outside the overall themes of the episode). I like episodes like this one in general and don’t necessarily need the show to make me laugh, but I would say that I wanted this hour to be slightly more … pleasant. When we got to the point where everyone gave out their Secret Santa gifts and things started becoming happy, it didn’t feel wholly earned. I appreciate the subtlety, and I think that subtlety could be key depending on where Michael and Holly are going, but I definitely think that this was more a lone bassist than a string quartet, more haunting and sad than particularly musical. The first three pages of Pam's comic (The Adventures of Jimmy Halpert) are online at NBC.com. I'll stick with Bear Man. Why did Holly agree to the transfer? Is it that great a job opportunity? Was she forced? I was so confused by this, as it seems like she would want to avoid such a move when in a relationship, but maybe they’re going to redefine it as a subconscious desire eventually? We’ll have to see. 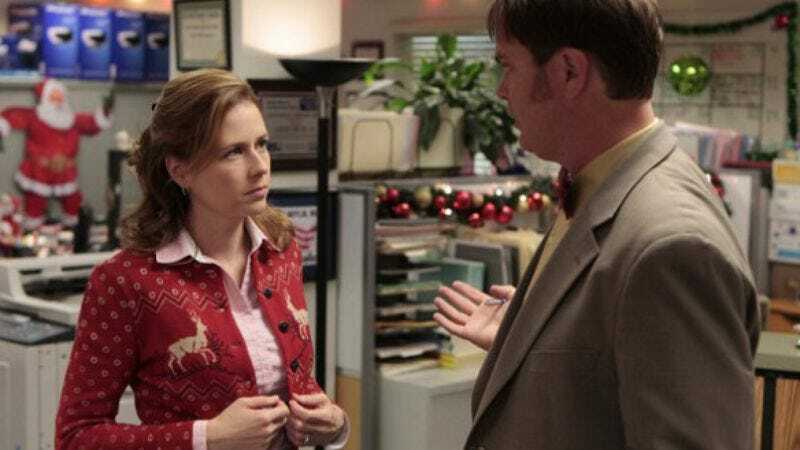 Some thematic connection to the idealization of the past: Holly’s belief that Jim and Dwight were the best of friends when she left. Rare circumstances where two actors on the show are in charge behind the scenes, with Mindy Kaling writing and Rainn Wilson directing—the former was pretty marginalized, with only the early Hello Kitty/Race joke and a couple of group reactions. Wilson was more central, but I guess his scenes were more about impact than complexity. 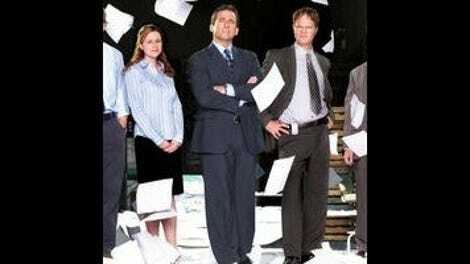 As far as I can tell, the episode seemed to cut in two for syndication purposes at Michael throwing Woody in the trash (since all hour-longs are split in syndication), but that seems like an odd place to pick up (with Dwight and Jim meeting with Holly and Michael over the feud). And yes, these are the things I think about when watching television. I'll prepare to dodge your snowballs of derision. As noted, I vehemently disagree with Erin's inability to discern Holly's true beauty, but her stepping in front of Holly to protect Michael was charming. “I don’t know, I thought I was enough family for my daughter”—my heart, it breaks. No time to quote the second half, so have at it folks.